. . . and babies make four. 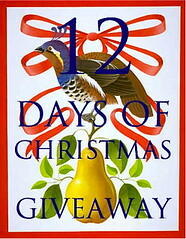 : On the ninth day of Christmas . 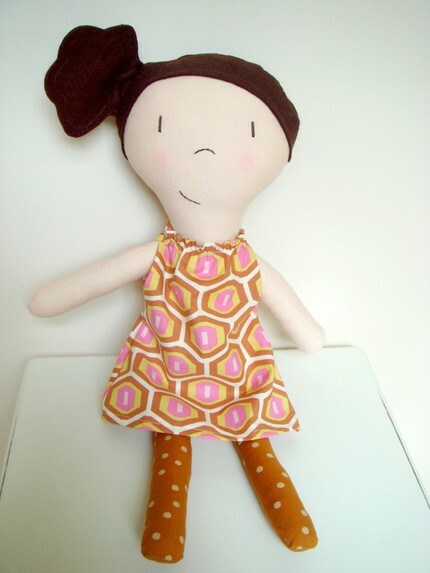 . .
From the moment I laid eyes on the sweet dolls made by bumblebird™ I was smitten. They tugged at my heart in a way no other doll ever has. I ordered one for Michal and I ordered one for Kenna. I crossed my fingers that they'd feel the same way about the dolls as I did. They were completely smitten too. Michal and Kenna -- such naming creativity! -- sleep with Michal and Kenna every night. They've joined us on vacation. They get played with a lot. The girls then decided Michal and Kenna needed friends so two more Bumblebird™ dolls joined our family -- also named Michal and Kenna. And I can tell you that they are equally loved and adored. 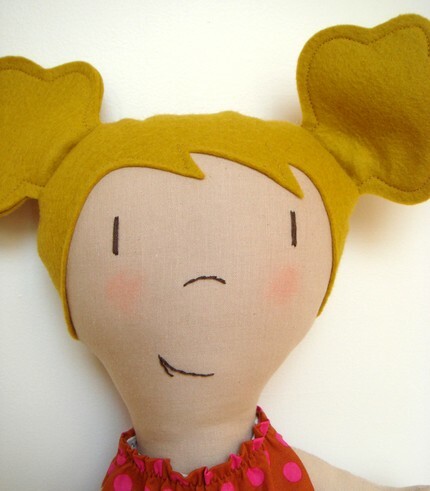 All of the dolls by bumblebird™ are created from tea stained muslin and have hand-embroidered details on their face. Their hair is made from wool felt in a variety of styles. They all have cute dresses and fun tights. And you can even buy extra dresses and pants and tops and pjs for them too. 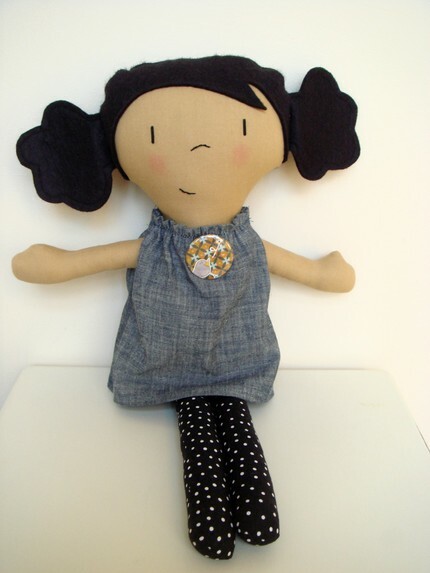 The dolls measure about 20 inches (50cm) tall and are just indescribably cute and oh so huggable. And guess what? bumblebird™ is offering one very lucky reader their choice of doll! To enter, visit the bumblebird™ etsy store and then come back and tell me which doll you would choose to be your very own. Because of Christmas, many of the dolls are currently sold out but you can see a much wider assortment if you click on "sales," a feature that shows prior sales. 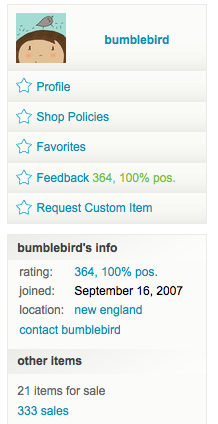 Look at the image below to see where you'll find the "sales" link in the bumblebird™ store. (Look at the bottom of the image.) Also note that the winner's doll will not ship until after the New Year. And a funny aside, Kenna just saw me working on this post and asked, "Am I getting another doll?" I told her "no," the person who made your dolls is giving one away to someone else. To which Kenna replied, "Do you think that person would want to share with me?" I love lucy and ginger! ..and so is the name. Too cute! I love Greenly, Pepper and Lucy. But the animals are also adorable! Ruby! Pepper! Olivia! So many cuties! My boys are big stuffed animal kids...I like bunny wunny and greenly the elf! So adorable!! I would pick little miss Pepper for my little sweety!! It would have to be Finn or Leo for me. Love them all, but especially Mina...she reminds me of my daughter! These are ADORABLE! I have a niece named Ruby, the Ruby doll would be perfect for her! they are all adorable, but olive the elf is even cuter than the rest! Pepper and Greenley are adorable! Well, actually they all are. Love the cute birds! I love Leo, but I think my daughter would like Pepper the best! Very cute! Pepper would be my choice! So utterly adorable. Greenly and Mina! These handmade dolls (and their clothing) beat any store bought baby! Fantastic! I love Greenley!!! I like her low pigtails! I like the Pepper bunny, which would be great for my son. Of course, his sisters would probably like Pepper(s) without the bunny ears. Bandit is adorable too. He looks very much like Swiper the Fox. OK, I just studied the 16 pages and my dream choice would be Greenley with black hair! I would like her to look Asian, of course and this would be the closest I think. I really like the Mina doll with the pigtails! I love Pepper! But I think my daughter would love the animals - either Hank or Stanley. Everything is so cute - hard to pick! Leo for my own Leo! They are all adorable, hard to pick just one! Pepper is cute though. I love Chloe and Leo too. I see that Chloe for Francie123 was customized - how nice that they can offer that. Oh, I love Ruby. My littlest one will love her. It's Ruby for me. She is so sweet and my little girl would love her! We love Ruby and Leo what cute dolls. thanks again Kristi, the fun never stops! Oh, Pepper is the cutest! What adorable dolls. I love the clothes too. My first choice would be custom, of course, but next to that is Pepper, Stanley, or Bumblebird! I like pepper, and roxy the fox, and the little blue whale. I just can't decide! Love Pepper and Greenly!! So cute!! The lovely little Ruby caught my eye! Love pepper and the birds too! looks the dolls for sale on her site are pretty much all gone. love the photos you posted, though! I'll take Pepper as well. Precious! Greenley sounds just like my Mia Hope :) What precious dolls, I saved her site on my favorites...you are a bad(good) influence !! Pepper is my favorite doll and bunny wunny is my other favorite. The original art work is super nice too! What a great giveaway. Pepper and Greenley are my favs! I love the dolls with the dark hair! I can see why the girls love them! My favorite is miss ruby! But I absolutely love her prints as well - great for kids rooms. Love the Pepper doll. Also the animals are adorable too. I would like any doll with black hair and of course would have to get an additional doll if I won. I have two granddaughters from China who have the beautiful thick black hair. I like pepper and Lucy! These dolls are adorable! I think pepper looks spunky! I love Lucy (haha), but I would want one that had an asian look for my daughter. Of the ones that weren't custom, I liked Pepper best. So cute....Lucy and Pepper are my favs! Mina, Pepper, Ginger, Ruby Greenley...sigh...they're all so sweet! I think Greenley stole my heart, though! Of course, I'd need to purchase another as I have twin toddlers and doll sharing is not something they do well. Ruby and Mina are my favorites. happy chloe is so sweet the little mouse is darling too! I think I would choose Greenly...these are precious dolls! We love the Lucy one, her pony tail on the side of her head is so cute. We would definetly have two Peppers in our house and we would have to add two Stanleys! So cute - can't imagine not wanting all the animals so the Peppers could have their own little farm! Kiki and Ruby are my favorites. Very cute! I have been reading all of your posts and have loved them all but this one, this one is it for me! This is the one that got me to post! Usually I don't bother because I am not one to win things but I love this doll! So I am going for it! ;) Love that little Pepper! I'd pick Mina since she looks the most like my daughter. Great giveaway! they are all so adorable that any will be just be delightful for Emily. Oh, and the dresses are equally cute. How fun to dress up the dolls. I think Pepper is the doll for us! What a cutie! These are adorable! My girls would love them! I think Greenley is the cutest of all, although it's hard to pick just one. I really like Pepper! Thanks Kristi! They are alladorable, but we choose Hank! Super cute! I love Pepper! My girl would love it! These are wonderful! I love miss pepper. Oh, the Pepper doll is adorable -- love that she loves to fly around! Pepper and Greenley are cuties. Oh - Pepper is too much!! I must have her! I hope I win...I hope I win!!!! Lucy and Ruby are precious too! I love Pepper! Probably because she reminds me of my Guangdong twins, especially when I can get them to wear pigtails. Very cute, I love that there are clothes for them. Mina would be the girl for Kajsa! Thanks for sharing these sweet dolls with all of us! ohhh! I LOVE LOVE LOVE Bumblebird. We actually own Sleepy Mike and I think I love him more than my daughter :) She might like a girly girl doll better which is why I'd choose the "greenley" doll. LOVE IT!